Cornflakes aren't just for breakfast anymore! Those of you following the Fringe Candy posts might think I have something against chocolate by now. That’s not true. 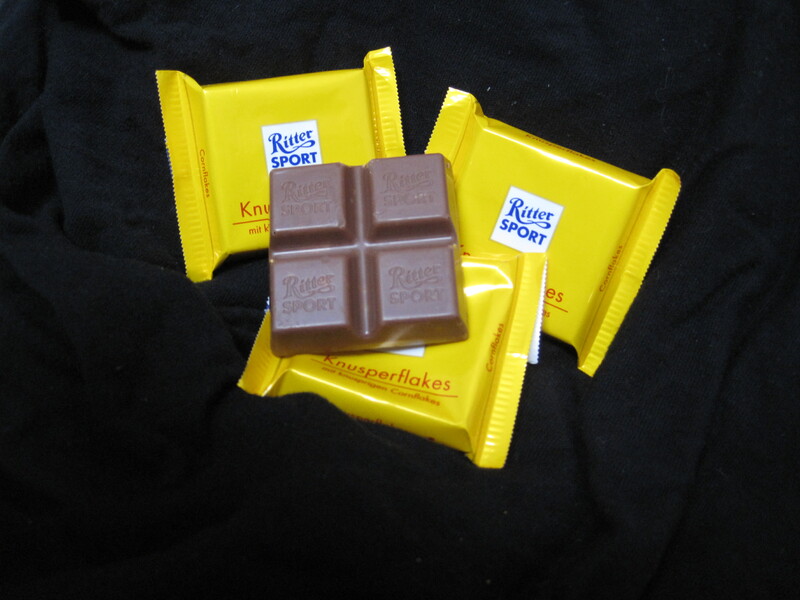 For instance, I’ve been in love with the Knusperflake (Cornflake)Ritter Sport bar for years. And this is a very special kind of fringe candy–the elusive beast known as the Import candy. Strange, perhaps, that I had my first taste of this delicious wonder on reservation. See, my wife at the time was a nickle-slot jockey. We went to one of the tribal casinos close to our house when we lived in Kent over six years ago. This particular casino had a three restaurants and a “Sweet Shop” that dished out fantastic ice cream. We’d usually stop off there after a night at the machines for a treat before heading home. In addition to ice cream, they had a selection of candy. And I’ll be honest, some nights I just wasn’t feeling the ice cream. On one such night, my eyes were drawn to the cheery yellow wrapper of the Ritter Sport Cornflake bar. I figured, “Well, rice crisps have had their turn in chocolate. Why not something different?” And I won’t lie, the yellow wrapper was a bit of an incentive too. I’m just drawn to the color. And it didn’t do me wrong here. Ritter Sport has been around under a few other names for almost 100 years now, and these Germans know their chocolate. The distinctive square bar originated in early 30’s in their facility outside Stuttgart. Despite the heaviness of the chocolate bar itself, it breaks cleanly along the scored lines. In fact, you break the bar before you even open it to avoid chocolate getting all over your hands. They were designed to pack easily into a shirt or jacket pocket, and boy howdy, mission accomplished! My one complaint is my usual problem with chocolate bars. Chocolate is, by its very nature, a very labor-intensive crop to harvest. The human cost in the regions where it is grown usually involve child labor. Whenever possible, I try to get fair trade chocolate or just avoid chocolate entirely. Ritter Sport isn’t fair trade (though I hear they might be developing a line of fair trade chocolate). That said, it is a delicious product. And knowing where it comes from means I eat far less of it. And that’s healthier all around. Pingback: a wonderful christmas time | Little Expressionless Animals.